Understanding the Instant JChem terminology will help you get the most from these Help documents. Some terms can be quite ambiguous (e.g table), and so Instant JChem tries to define terms precisely. 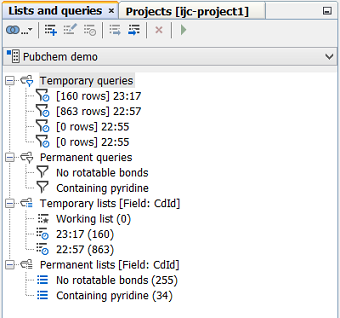 Instant JChem is primarily a database application, allowing you to work with data in a database. But Instant JChem tries to provide a higher level of interface to the database artifacts, and to insulate the user from the intricacies and complexities of the database. To do this it uses objects that are at a higher level of abstraction to those in the database to make them easier to use, but each of these objects typically correspond to a type of artifact in the database. Understanding these terms is important. Or more correctly, a connection to a database. Contains data is a row and column paradigm, just like a database table. Usually a single database table, but potentially multiple tables. Represents data from one of more columns in a database table. An association between two entities as reflected by a foreign key constraint in the database. Allows you to separate different bits of work into discrete units. You can have one of more projects open at a time. They are displayed in the projects window. A project usually contains one or more IJC Schemas and any other files you may have added to your project. A hierarchical arrangement of Entities that define an arrangement of master-detail data. For each row in a master entity there might be one or more corresponding rows in its detail entities. Data from a particular DataTree that reflects the current query and sort instructions. A display of data from a single ResultSet. Currently there are 2 types of view, the Grid View which provides a tabular (spreadsheet) representation of data and the Form View that allows you to define a form with which to display your data. Multiple views can use the same result set, in which case the query, sorting and selection is coordinated between the views. A set of query criteria that can be applied to a ResultSet. Queries can be stored and re-executed at a later stage. A set of IDs that can be restored to a ResultSet (and hence view) at a later stage. e.g. "Active compounds". Lists can be edited and combined. Each Schema ( for local databases or for remote databases) is represented by a node within the Project ( ). 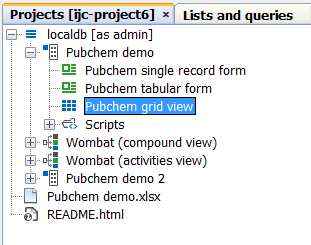 Double-click the schema node to open the Schema Editor which provides the administrative interface to the database (allowing you to manage the Entities, Fields, Relationships etc.). Under the Schema node are the Data Trees ( ), and under the Data Trees node are the Views ( for a form view or for a grid view ) for that DataTree. Entities are not directly displayed in the Projects window - you instead work with Data Trees that contain one or more Entities. ResultSets are not displayed anywhere - they are used internally by the Views to obtain their data and to query and sort their data. Lists ( ) and Queries ( ) are displayed in their own window. You will see the lists and queries for the currently selected DataTree.